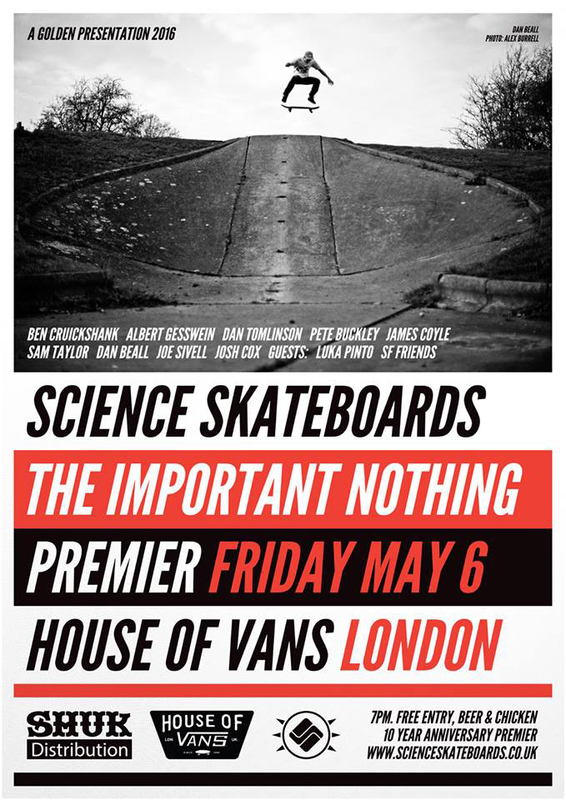 Science Skateboards will celebrate their 10 year anniversary by premiering their new full length video, The Important Nothing at House of Vans London on Friday May 6. Full parts from Josh Cox, Joe Sivell, Pete Buckley, Sam Taylor, Dan Tomlinson, James Coyle, Dan Beall, Ben Cruickshank and Albert Gesswein with guest sections from Luka Pinto and San Francisco friends. Filmed in the UK, US, France and Japan – edited to an eclectic soundtrack in keeping with the recent Science mixtape series. Free admission along with free beer and chicken.